I was hesitant to post this shaker card, because after it was finished, I realized I should have used a white panel inside the shaker so you could see the contents and the colors. Oh well, that's how I learn - through mistakes. I used PTI Berry Sorbet cardstock along with my Spellbinders Postage Stamp dies, placing a smaller die inside of the larger one to create the shaker frame. I used clear tulle for the shaker and added pink, white, gold, and black sequins inside. I added a couple of small Cheery Lynn flourish dies cut with white, and added matching flowers done with SU! mini punches (r). The centers were filled with tiny black gemstones and the sentiment is by Sweet'n Sassy stamps. I'm sharing this with the Tuesday Throwdown Challenge #368 which is to make a shaker card. Gorgeous card, Carol! I love the shaker cards you have created as I have one you made me for Shawn & I's wedding anniversary! Those types of cards are so fun but alot of work. You always seem to put your heart & soul into them using the pretty tulle and that amazing flourish die! Love the colors of this one and all those lovely little flowers! Great job! TFS and hope your staying warm! Burrr!! 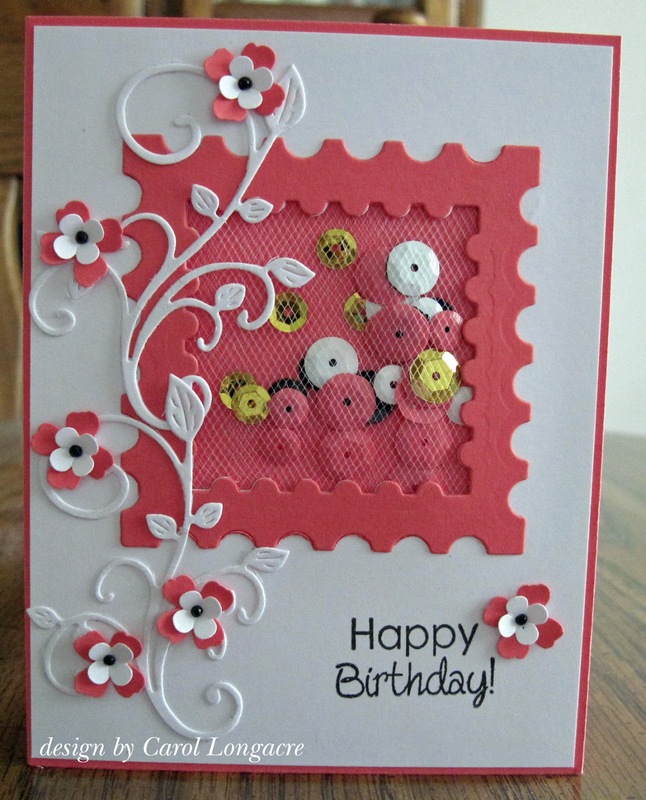 A super shaker card Carol,I like the tulle for the window and the lovely flourish die. A fabulous shaker card Carol, lovely colours and pretty flourishes. Adorable little shaker, the postage diecut looks so pretty! The flourish is so cute and sweet! Lovely make in red and white! That is such a pretty shaker design. Love the vine and flowers die. 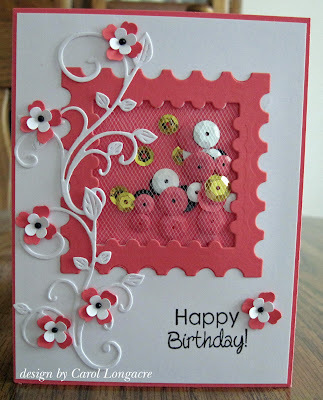 I LOVE the tulle as a cover for the shaker, such a beautiful card Carol, such pretty flower die too. Lovely card, Carol. One thing I can say with pure certainty is that we both use our flourish dies! Nice color, also. Fun card, very bright and fun! I think either pink or white would have been great for the inside panel. So pretty and full of texture and colour. Great card, Carol! This is so cute! I love the die cut flowers and the fun idea of using tulle to hold the shaker pieces. Thanks for joining us at Tuesday Throwdown.